Add their website link to side bar and create a post about the contest on your blog, facebook, myspace…etc. 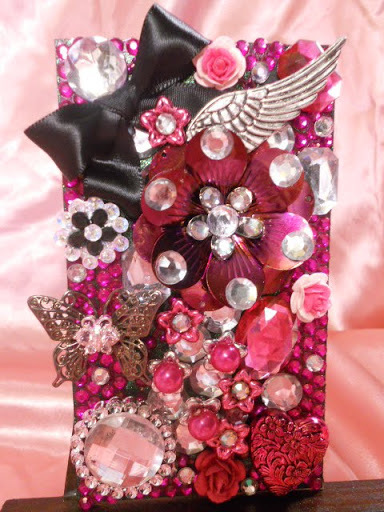 Create a tag (standard shipping tag) and embellish using scrapbooking materials of how you’d like your phone to look like. Explain in your video what you used to create your tag. Post your video response to this video. All international residents can participate but there is a $25.00 shipping fee. 18 years and under need parents permission to participate in the contest. Here is a photo of my entry! Gorgeous Cynthia! Love how you layered all your BLING together…very pretty. Be sure to add a link to AquaCharms on your right side bar. Thank you again for participating! Gorgeous, i love it…it's so YOU….